BTX Technologies and Visionary Solutions have introduced the M400 Series of H.264 encoders. 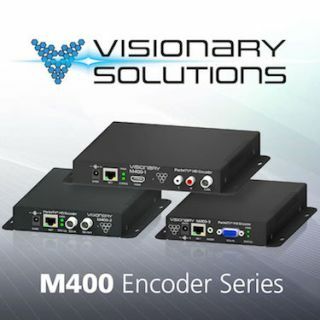 Visionary Solutions’ M400 H.264 encoders transform live video sources into full-screen, full resolution IP video streams that are transmitted over IP networks. The encoders support HD and SD formats and can deliver via multicast, unicast, or HTTP. The M400 Series features a small form factor and flexible H.264 encoding up to 1080p with dual bitrate output for different displays and different applications. There is an onboard scaler for input video and the sources include HDMI and CVBS, SDI or VGA and Component. The management and configuration of all the M400 Series of encoders can be done via a web interface or web API. The M400 series allows customers to encode a high quality MPEG-TS stream for the local network, while at the same time sending a low bitrate stream to a CDN for redistribution. All backed by Visionary’s outstanding support and knowledge of IPTV applications. The M400 Series of Encoders are shipping today and will be featured at the BTX booth #C9806 at NAB in Las Vegas from April 18th – 21st.